We were perusing the latest postings at one of our favorite financial “survivalist” blogs when we noticed a pattern. The contrarian investing style touted by these independently-minded folks hardly seem to be contrarian at all, and furthermore, do a real disservice to folks who rely on them for sound advice. For example, we are offered a weekly “contrarian” stock pick that is currently trading below $5 a share. The “contrarian” aspect of the picks come from the fact that these stocks are presently out of favor with mainstream stock analysts, yet are alleged to be sound companies ripe for a turnaround. That’s all well and good but we have to stop right here and remind readers that the best pick on Wall Street is still nothing more than a modest-sized pile of crap when compared to the TRUE contrarian investment – real estate. And if you’re not up for stocks, the website goes on to discuss gold stocks, precious metals and their ilk. If you remember nothing else we say today, remember this; stocks and gold are NOT contrarian investing! These sorts of investments play right into the hands of the power elite controlling the world’s financial markets. And if you don’t believe in that sort of conspiracy theory, let’s try an appeal to common sense. 1. 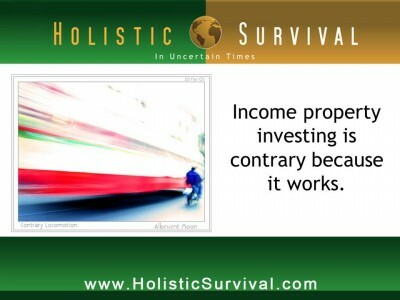 As Jason Hartman frequently admonishes, income property investing makes you a direct investor, which is the only way to insure you’re not being bamboozled, hoodwinked, or outright cheated by a broker in a fancy suit. 2. Real estate is the only investment that allows you to tap into the power of leverage to purchase assets. Think of it like this. $100,000 worth of cash buys you exactly the same amount worth of stocks. In real estate, an equal pile of money, thanks to the idea that you only have to put up 20 percent of the purchase price and are allowed to borrow the rest, allows you to control property valued at five times more than one hundred grand. In a word – leverage. The other big idea to keep in mind is that in inflationary times, currency-based assets like stocks and precious metals are doomed to devalue along with our dwindling dollar. In the presence of inflation, properly structured debt (like a long-term, fixed-rate mortgage) allows you to actually increase your wealth when you rent it out. How precious is your metal?